APPLICABLE MODELS: Fast charger mode is ONLY available for Galaxy S8 plus, Galaxy 8, S7, S7 Edge, galaxy S6 Edge plus, Note 5. Other Qi-enabled devices will charge at a regular speed. Not as fast with phone case (metal case block charging). Note: Those phones without QI-function need and additional QI wireless receiver (Not included). INTELLIGENT PROTECTION: Blue light for standby state; Green light means charging. LED indicator will automatically shut off after charging full (Sleep friendly); With Seneo overheat protection technology, wireless charging stand will work great in the condition of over-voltage, over current and high temperature. UPRIGHT ANGLE：Convenience of being able to charge your device upright while listening to music or watching a video when lying in bed; The wireless charging stand is nice for reading or following recipes in the kitchen. It is easy to find your cellphone almost all the PAPER in office. CHARGING CONVENIENTLY: With 2 inner coils, Seneo wireless charger works perfectly in portrait or landscape phone orientation; Placing your phone on the cradle without having to mess with a cord by wireless charging; Cord plugs in at back of base, no longer need to fight with the charger cables; Rubberized tray at the bottom is grippy so the phone doesn’t accidentally slide off. TIPS: Highly suggested purchasing one QC 2.0 adapter (not included) for fast charging. Original adapters and cables are supported. 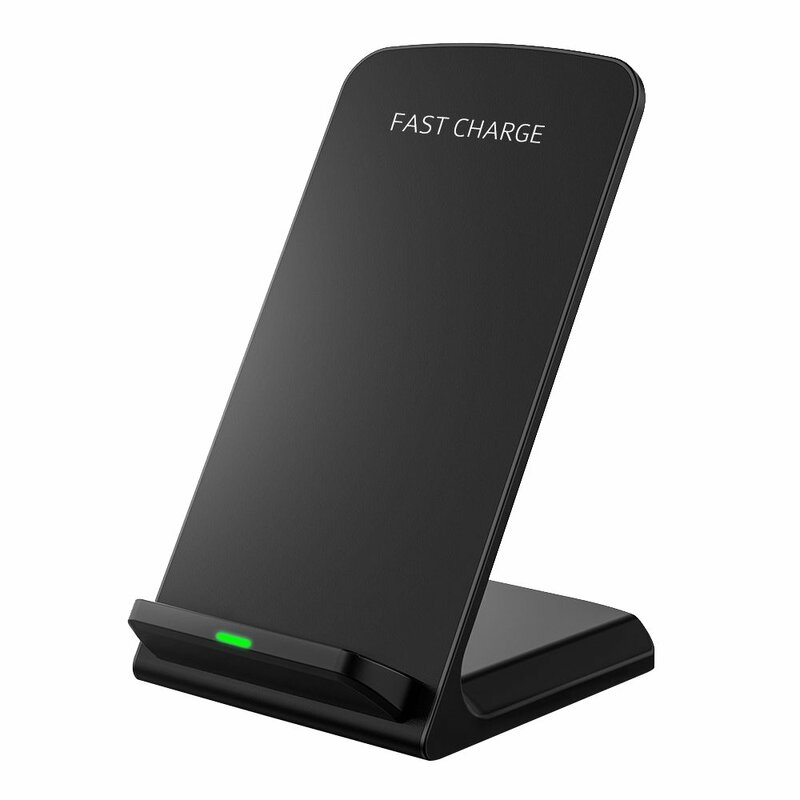 Package includes: 1 x SENEO fast wireless charger stand, 1 x Micro USB Power Cable (NOT including the AC adapter), 1 x User Manual. Q: Why can’t my S8 fully charged? A: As S8 and S8 Plus are designed with built-in charging protection. When they are charged with indoor temperature at 30℃, the temperature of your phone may exceed 40℃ so that it will stop charging automatically when the battery is charged 70%-80% to protect the battery from over-heating. Q: Why can’t I use fast charge? A: Reason 1: Your phone is not Qi-enabled. Reason 2: Your charging adapter is not a Quick Charge adapter. And if you use a computer as power source, the charging voltage may be too low to work. Reason 3: Your phone will be in fast charging mode at the beginning and automatically switch into normal charging mode if temperature rises, which is normally due to its charging protection. Seneo wireless charging stand will shut off when fully charged to protect battery and you can feel assured when charging overnight. Easy to find cellphone amongst all the PAPER and check text; Use it in the bedroom next to the bed and can easily see the screen when something comes up and can hit the snooze button really easy. You can charge horizontally or vertically by 2 coils. You can charge cellphone with case, but the speed will be slower than without phone case. Metal case or metal piece on case will block charging. Fast adapter like QC2.0 adapter is highly recommended, original adapter and cables can be used for connecting. When the light flashes by blue and green alternately, please check that if there is foreign body, like metal matter and then place it charge again.